AACSB-Accreditation of a German School of Business. Dissertation von Sophie Wohlhage, Verlag Dr. Kovač 2019, 268 S.
Accreditation as part of quality management has become increasingly popular within the sector of higher education – especially in the field of management education. Accreditation processes pursue the idea of continuous improvement through the cyclic assessment of organizations against internationally agreed and accepted quality standards. The longitudinal study examines the AACSB accreditation case of a German business school. AACSB accreditation bases on formative evaluation, which assesses the school against the background of its mission and takes a consultative perspective to further the school’s development. The accreditation lens provides unique and rich insights not only into the struggles of a business school to make sense of the accreditation standards but also of articulating its identity and embarking on a profound process of organizational transformation. The study uses a framework of organizational identity and sensemaking as two distinctive, but related organization theories. The case problematizes the sensemaking perspective to identify how, why and where sensemaking as processes of joint negotiation of meaning have emerged and which role they played regarding the development of the school’s identity and transition. 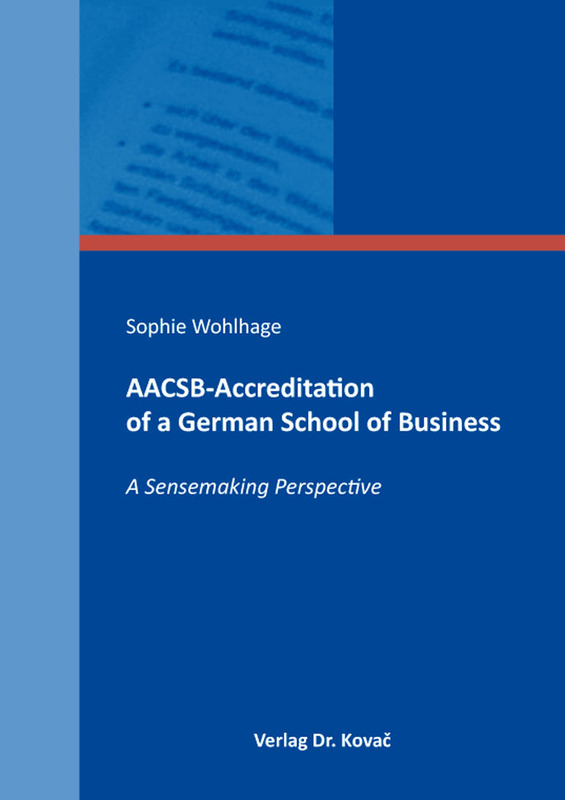 The research provides a real-case example that offers theoretical and methodological insights about the organizational development and transition of a German school of business in the light of its AACSB accreditation. The comprehensive analysis depicts how the school made sense of the accreditation challenges through embracing the opportunity to reflect its development, ambitions and identity claims in the light of international practices and standards as articulated by the AACSB. From the practical stance, the study provides in-depth insights from a rich empirical background, which contribute to the knowledge of higher education and accreditation experts, managers and members of accreditation organizations alike. As one of the first studies, it integrates the concepts of sensemaking, organizational identity and formative evaluation and advances theoretical knowledge about sensemaking practices and processes in the distinct organizational context of higher education. The dual perspective of the research setting provides evidence of the interconnectedness of sensemaking and organizational identity development in the context of formative evaluation.